You are sure to find what you’re looking for in our extensive fabric showroom. 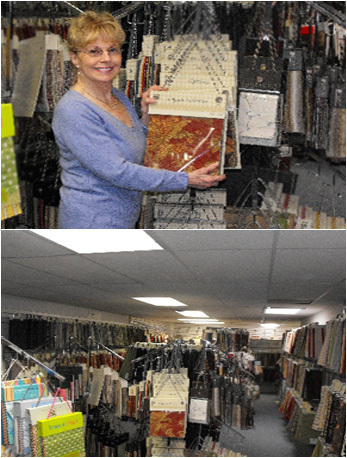 You are sure to find what you’re looking for in our extensive fabric showroom. We carry thousands of samples from many of the top name designer fabrics. From silk to leather, velvet to vinyl, we carry or can get all fabrics available to the trade. Our knowledgeable friendly staff is always willing and able to assist you. You can browse through our samples, have an on-site decorator to help you, or bring samples home. We’ll loan you as many samples as needed to make a decision. When you are in our showroom, the samples provide information such as fabric content, like blend of fibers, and abrasion ratings. These indicators show the durability and comfort of the fabric. If you can’t make it to our showroom, we will be happy to come to you. Look for specials on top designer names. Also, as a courtesy, we now offer a free pass to the Washington Design Center in downtown Washington D.C. For directions, please see www.dcdesigncenter.com. 20-25% off Entire Fabric Selection For A Limited Time Only.